Banda Api volcano forms a small isolated 3-km-wide island in the Banda Sea, Indonesia, 130 km south of Makulu Island. The volcano rises 4000 m from the sea floor and is the most recent and very active cone of a 7 km wide volcanic caldera mostly under water. It is one of the most active volcanoes in the region and is known for violent activity including tall ash emissions, lava fountaining, strombolian explosions and occasional lava flows, some of which which have reached the sea. Because of its (for Indonesia) unusually effusive behavior and frequent activity, Banda Api has also been given the nickname "Etna of the Banda Sea". Despite its remote location, Banda Api ranks among the volcanoes in Indonesia with the best documented history (since 1586), thanks to its strategic position at a cross-road of the Portuguese and Dutch spice trade sailing routes. The caldera has 3 other islands forming the southern and eastern walls: Lonthor, Pisang and Kapal. Banda Api is the NE-most volcano in the Sunda-Banda volcanic arc. Its lavas are mainly basaltic-to-rhyodacitic in composition. At least two episodes of caldera formation are believed to have occurred, with the arcuate islands of Lonthor and Neira considered to be remnants of the pre-caldera volcanoes. Among divers, the surrounding waters are (have been?) famous for the specatcularly large numbers of sea snakes that used to be found here mating in swarms of thousands. Banda Api erupted explosively on 9 May 1988. An ash plume of 3 km height was produced and large incandescent bombs were ejected. Lava flows traveled east towards Neira Island. A row of 5 vents were active at the summit. During 8-10 May, frequent earthquakes were felt in Neira village 2 km east of the summit. 1800 residents were evacuated to Neira and Lontar Islands, and 5,000 of Neira city's residents were evacuated to safer areas.  Satellite observations showed that the ash from the eruption reached an altitude of 16 km. The eruption ended in August 1988.